"Having been at Gen Re for over a year now, I find that the knowledge I have gained through in-branch training and CPCU testing has grown exponentially in a short amount of time. We are constantly being challenged to learn more and do more to broaden our industry knowledge." 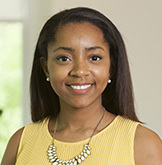 "I am an actuarial student and mainly focus on Long Term Care, but in my short time at Gen Re I have also already gotten experience with many different products, including Life and Medical Supplement insurance. Each day is filled with learning, and I look forward to what my future at Gen Re has in store." A career with General Re means joining a global organization that delivers reinsurance and insurance solutions to companies in all segments of the industry. The insurance, reinsurance and investment management companies within General Re include: Gen Re, NEAM, General Star, Genesis, USAU and Faraday. Unsolicited CVs are welcome and can be submitted to the right. 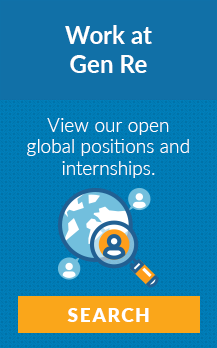 To see if there is a Gen Re office near you, please view our global office locations. Gen Re values excellence, integrity, personal responsibility, diversity and optimism. Our flat management structure and team-based environment promote collaboration and free-flowing communication. Gen Re employees enjoy a strong work/life balance, and a comprehensive benefits and compensation structure. Gen Re fosters a culture of ongoing training and personal development. The company encourages employees to participate in in-house programs (such as business skills and leadership) and external technical seminars. We also reward employees for attaining industry certifications/qualifications. Start your career and fulfill your potential.